Life lessons and roads I have traveled. Toward the end of September — September 30 to be exact — I’ll be spying on computer world news. Intelligence reports mark this date as a likely press event to unveil Windows 9 (code-name: Threshhold). In April 2014, attendees at the Build conference were treated to a sneak peek of Threshhold. Rollout date is currently set for April 2015. Why the hurry? Windows 8 just debuted. Therein lies the problem. Windows 8 has received a less than stellar reputation. For the general computing public, Windows 8 is too heavy on apps and too light on desktop functionality. Honestly, I like Windows 8 — my previous OS was Vista, the OS that almost single-handedly brought down the free world. I’ve also not upgraded to 8.1 because of a number of sketchy reviews from people who did. I’ve tracked down a few new features of Windows 9. Beware, nothing is one hundred percent set in concrete gumshoes. Changes/features may or may not be universal across desktops, laptops, and tablets (we hope not); and Microsoft could tweak anything to insure the best performance for each specific hardware device (we hope so). 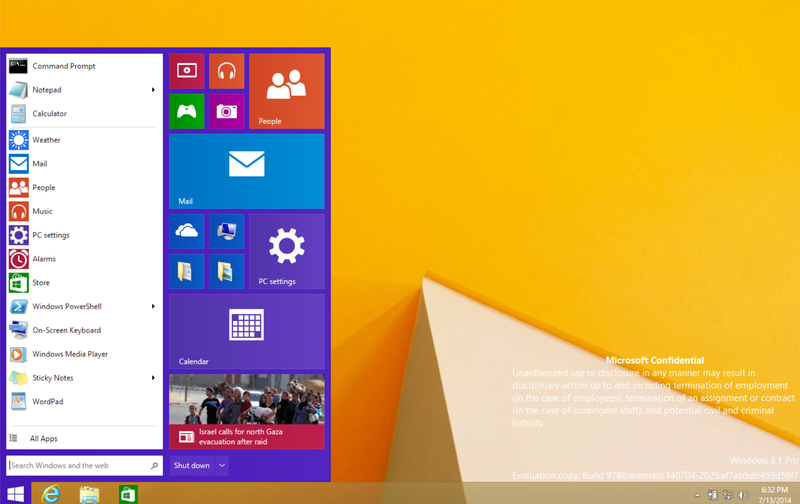 Start menu is back, just when we Windows 8 users figured out how to live without it. It’s probably like a bicycle: once you can learn, you never forget. This is a leaked printscreen of the new Start menu. Removal of the Charms bar. 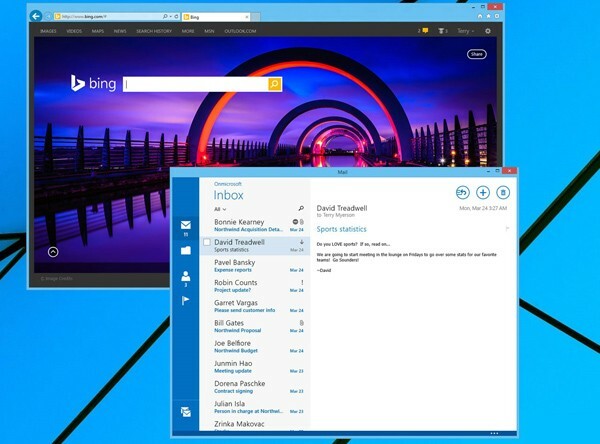 Remember the Windows 8 bar that opens when you hover over the right top or bottom of your desktop? Yep, that’s the Charms bar. Honestly, it’s more of an Apple-wanna-be bar. It’s not coming back. At least not in Windows 9. 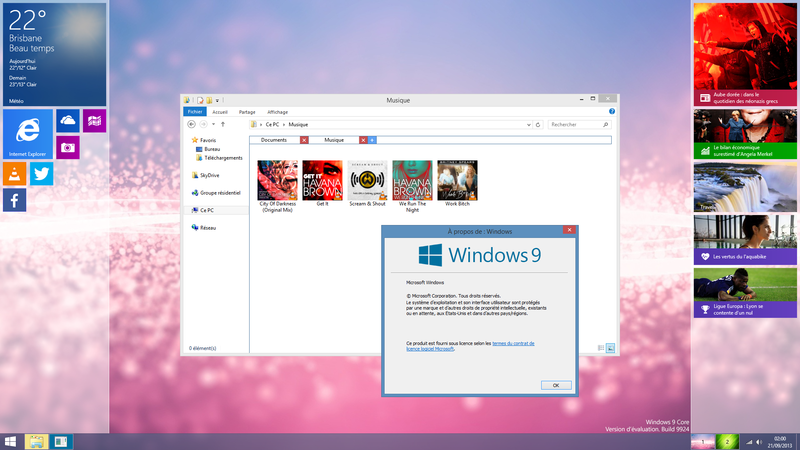 Metro apps are still a part of Windows 9, but in a much lesser capacity… or so it’s said. Some of the leaked screenshots make me wonder about the reliability of the operatives. They’re reporting Window 9 Apps will open in small desktop windows. What’s a metro app? It’s all those little box programs that show up on the Windows 8 Start Screen, including the ones you added from the App Store. Metro apps are fantastic if you have a touch screen tablet, but — as everyone found out with Windows 8 — not very user-friendly for keyboard computers. Cortana — Microsoft’s voice-based assistant currently available on Windows Phone only — could be part of Windows 9. Don’t panic. You’ll probably be given the choice to turn her off and on. And guys? Enjoy it. You may never get a chance to silence a woman this easily again. Possibility the new Windows OS will be subscription-based. Rumors are flying about the price. Software watchers vary in opinion of the cost from Windows 9 being free or negligible to subscription-based. Remember Office 365 priced at $100? It’s a subscription-based MS program. You get to use it for 365 days. When your subscriptions runs out — you guessed it — you have to pay again. Personally $100 annually for an upgrade is way to expensive for my taste. If Microsoft charges a subscription fee anywhere close to Office 365, and Windows 9 doesn’t perform up to expectations, this could start the next Cold War with OS defections inevitable. 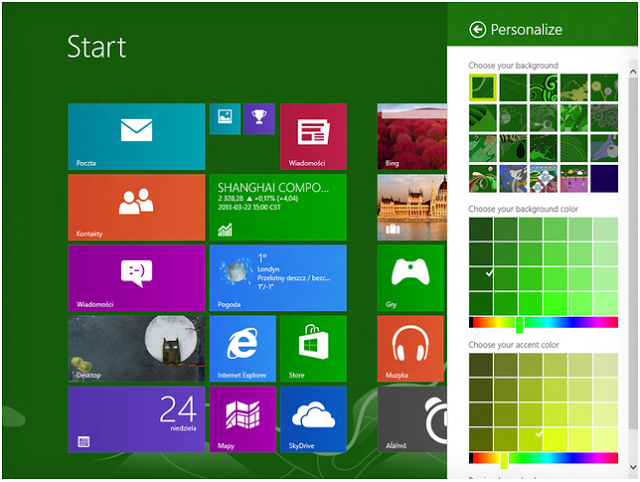 I’ll leave you with a few more leaked screenshots of Windows 9. Enjoy. DISCLAIMER: Any and all ideas presented in this blog are solely my own unless otherwise noted. I experience troubles with technology just like any other person, and if I stumble upon a fix or suggestion I feel could benefit others I pass it along. At no time, have I suggested or implied that I hold any degrees or certificates related to computer repair. I have during my career assembled parts into working computers; done troubleshooting on hardware and software; utilized a great many computer programs and software; designed and updated websites and blogs; as well as created brochures, banners, and flyers. This entry was posted in Computer Technology and tagged operating system, Patti's Pathways, pattispathways, Threshhold, Windows 8, Windows 9, Windows OS, Windows upgrade on August 31, 2014 by Patti. Want larger print? Hold down the Ctrl key while rolling the mouse's scroll button. It's magic.